Ms. Norcia has performed the Draper repertory to tremendous acclaim Off-Broadway at the Cherry Lane Theater, at Carnegie Recital Hall, London’s Duke of York Theatre, Munich’s Gasteig and other international venues. Like Ruth Draper herself, she plays numerous private engagements and charity benefits. In the course of an extraordinary career, the great solo performer Ruth Draper transformed the dramatic “monologue” from parlor entertainment into high art. Draper’s monologues were nothing like today’s standup comedy. They were fully realized small plays in which she often portrayed multiple characters and populated the stage with an invisible but completely credible supporting cast. From the 1920’s until her death in 1956, Ruth Draper moved audiences around the world to both laughter and tears with her warmly observed and hilariously funny portraits of society matrons and working class women alike. 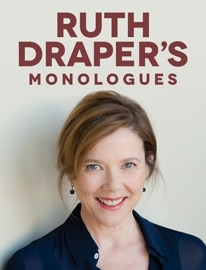 In 2014 The Draper Co. licensed a production of the Ruth Draper monologues starring Annette Bening at the Geffen Theatre in Los Angeles, CA. The production ran April 8 – May 18, 2014. See the Geffen Theatre website for more information on this exciting event!